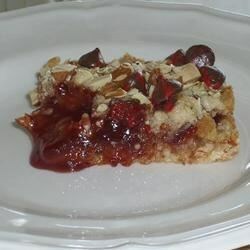 "These yummy squares are fun and easy to make. Kids will enjoy using their hands to mix the ingredients!" Preheat oven to 350 degrees F (175 degrees C). Line 8x8 inch baking dish with foil, and lightly grease the foil. Place the flour, oats, and sugar into a mixing bowl. Add the butter and mix, using your hands, until mixture has the consistency of coarse crumbs. Stir in the almond extract. Remove 2 cups of the flour mixture and place in a separate bowl. Pour the remaining flour mixture into the prepared pan, and press evenly across the bottom. Spread raspberry jelly over the flour layer. Gently press the reserved 2 cups of flour mixture over the jelly. Sprinkle the top with almonds. Bake in preheated oven until top is golden brown, about 30 minutes. Cool in the baking dish. Lift out foil to place square on a cutting board. Using sharp knife, cut into 9 squares. they were really gritty in texture, way too sweet, and the almonds didn't stick. it was crumbly upon the bite as well (falling apart). won't make this again. needs more of a doughy dough. I made this with peach jam and it was great. Next time I would cut back on the sugar some- they were a little sweet for my taste.